The Fellowship was fortunate enough to obtain a copy of SAVAGE DRAGON #179 from Image Comics. The story is written and drawn by Erik Larsen. INVASION! Dragon is off-planet trying to find a home for his race and is attacked by a group of Tyrraneans. Meanwhile, invasion force of Tyrraneans are also attacking Earth. Our heroes are trying to repel them, but are they overmatched? Even Overlord, realizing what is at stake, wrestles the leadership of the Vicious Circle away from Brutalizer and assists in fighting for Earth’s protection. In their darkest hour, Angel drops a bombshell on Malcolm Dragon! I’m a big fan of Larsen’s art. His style reminds me of the action and fun that comes from the works of Jack Kirby and Walter Simonson. The story is simple in this issue: aliens are attacking, people are dying, cities are being demolished, and heroes are being heroes. Can Dragon travel across the universe to get to Earth and save everybody in time? You know darn well he’ll do it, but how will be interesting to see. 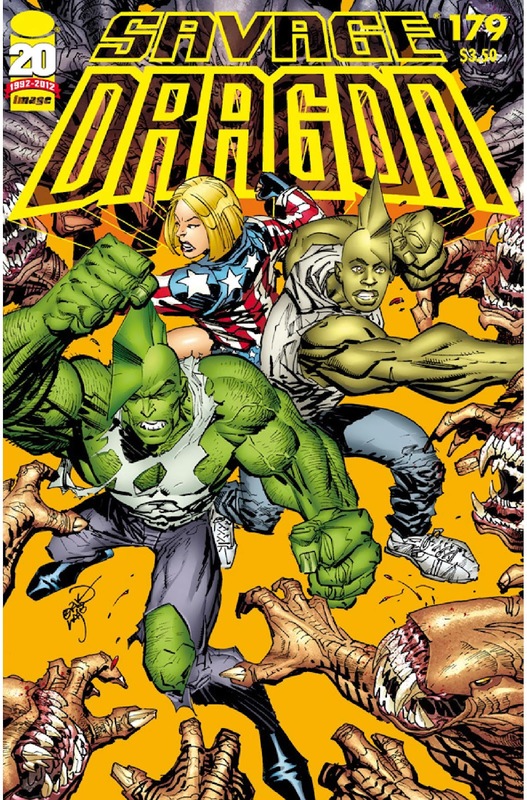 SAVAGE DRAGON #179 is in comic book stores now or available at www.imagecomics.com.